In order to be admitted to the FIU School of Music, you must first be admitted to the university and then successfully audition for the School of Music. Admission to the university is very selective and you are urged to submit your application as early as possible. You can begin the application process to FIU by visiting Graduate Admissions. The School of Music requires that all applicants applying to the Master of Music (MM) degrees are required to submit a pre-screening process through the Getaccepted web-based portal. Audition dates are listed below. In the application, you will be asked to select your preferred live audition date. All undergraduates seeking admission to the School of Music must audition on an instrument/voice, including freshmen and transfer students. This includes prospective majors and minors in music. Your materials must be submitted through GetAcceptd at least 72 hours prior to your preferred live audition date. 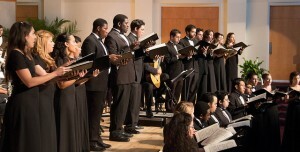 Choral students at FIU are offered a dynamic curriculum that includes private instruction from an outstanding artist faculty with national and international reputations. The members of the FIU voice faculty have performed with major opera companies and orchestras from around the world. They bring their profound artistry, professional experience, and creative teaching abilities to the FIU student body. In addition to regular performances with FIU ensembles, the voice faculty also remains active in the professional field, representing FIU in solo performances and master classes around the world. The School of Music’s Guest Artist and Artist-in-Residence programs bring FIU voice students into contact with an extensive array of prominent performing artists and composers each year. The Guitar Program at FIU offers aspiring students a wide range of opportunities to develop the skills necessary to become high-level professional musicians. In addition to weekly private lessons, students participate in the guitar orchestra, perform in regular guitar forums, attend the guitar literature class, and work with guest artists in masterclasses. The Guitar Forum provides students with the opportunity to perform newly learned solo and chamber repertoire, and also broaches various topics, such as technique, interpretation, practice methods, memorization, amplification, recording, competitions, and career planning. The FIU Miami Guitar Orchestra (FIUMGO) aims to help guitarists develop ensemble skills, improve reading skills, as well provide experience working with a conductor, and perform a wide range of repertoire both on-campus and off-campus. The Guitar Literature Class is a study of the history and literature of the guitar, covering time periods beginning with the Renaissance all the way into to modern times. The class focuses on topics such as historical performance practices, significant guitar composers and their contributions to the art of the instrument, and teaches the techniques for how to transcribe music from French, Italian, and German tablatures into modern notation. Besides the FIU Miami Guitar Orchestra (FIUMGO) and regular guitar studies students, students can also perform with other instruments in theChamber Music Ensembles and New Music Ensemble. There are also opportunities to study and perform with the Collegium Musicum on replicas of historical instruments, including Renaissance and Baroque lute, theorbo, and viola da gamba, courtesy of the Collegium’s instrument collection, the finest and most extensive in all of South Florida. During their studies, the undergraduate instrumental performance majors prepare two recitals at the junior and senior level. The graduate students present two 60-minute recitals and write extended program notes for the second recital. In addition to masterclasses and concerts with guest artists, the FIU School of Music has been hosting various festivals regularly, such as Miami International GuitART Festival and New Music Miami ISCM Festival. American Jazz is a reflection of America’s history. As American culture evolves, people from all over the world come here, carrying with them their musical traditions, styles, instruments, and the cultural and spiritual expression within their music. At FIU we have a student body comprised of young people from diverse cultures – North America, the Caribbean, and South and Central America in particular. One of our main goals is to nurture these young musicians ability to express themselves through music, incorporating their ethnic and cultural traditions within the creative framework of American Jazz. While instilling a high level of proficiency within the existing American Jazz idiom, our emphasis on self-expression and experimentation fuels innovation and originality in instrumental performance, composition, and improvisation. This process is the essence of American Jazz. 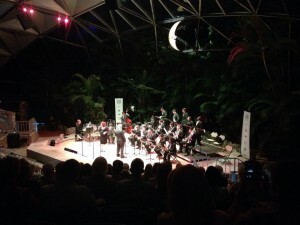 FIU Jazz Ensembles perform on-campus concerts and events, as well as jazz festivals and clubs. Guest artists such as Adam Nussbaum, Ingrid Jensen, Jim Snidero, Paquito D’Rivera, Johnathan Blake, Marco Marcinco, John Fedchock, Randy Brecker, and others are often featured in concerts, as well as workshops and clinics. 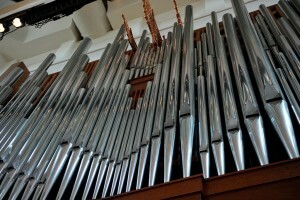 The Bachelor and Master of Music programs in Organ Performance provide students with multiple opportunities to acquire a varied repertoire representing the major stylistic periods in an effort to prepare them for the exigencies of the professional field, including the American Guild of Organists (AGO) Organ Certification. Performance opportunities include participation in large ensembles (Symphony Orchestra, Choirs, Collegium) and chamber music. Regular recitals given by members of the American Guild of Organists and guest performers enable students to participate in master classes throughout the year. The Sydell Ida Wertheim Organ is the spotlight of the Herbert and Nicole Wertheim Performing Arts Center. The prestigious 125 year old Schantz Organ Company took nearly a year to build the 26-ton organ that is the largest in Miami-Dade County and one of the most technologically advanced in the country. This magnificent instrument features a solid-oak console with four manual keyboards and a pedal clavier that controls its 4,255 pipes. It provides a wonderful tool for aspiring organists and unparalled performance opportunities for seasoned virtuosi. Just as the performing arts center was made possible through the generosity of Herbert and Nicole Wertheim, so has their kindness made FIU the recipient of this exceptional instrument. In gratitude, the university dedicated the concert organ to the memory of Dr. Herbert Wertheim’s mother, Sydell Ida Wertheim, who passed away in 1997. To read the biography of Dr. Herbert Wertheim, click here. The Bachelor and Master of Music programs in Piano Performance are designed to develop the necessary multifaceted skills demanded by today’s music profession. Versatility is achieved through the exploration of a varied solo-concerto repertoire encompassing major–as well as less known–works from the four major stylistic periods and the cultivation of an active collaborative experience through accompanying and multiple ensemble participation (Choir, Chamber Music, Orchestra and Wind Ensemble, Piano Ensemble, Collegium and New Music Ensemble). 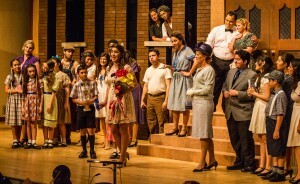 An integral component of the program is the commitment to provide students with various performance opportunities in theme-oriented programs offered at the Herbert and Nicole Wertheim Performing Arts Center, Concert Hall and at different venues throughout the South Florida area as community outreach activities. Off-campus venues have included the Miami Art Museum (MAM), the Bass Museum in Miami Beach, the Coral Gables Museum, the Kossuth Hungarian Center, and the FIU Biscayne Bay Campus among others. FIU possesses two Steinway Model D concert pianos in the Herbert and Nicole Wertheim Concert Hall. The FIU School of Music is one of 16 institutions in the US that host a chapter of the American Liszt Society. Performance opportunities include the annual concerts of the Liszt Festival held in October as well as numerous recitals and master classes given by guests, including Liszt chapter presidents from around the US. For more information, click here. Recent guests have included Dr. William Wellborn (San Francisco chapter), Dr. Nancy Roldán (Baltimore chapter), Gwendolyn Mok (San Jose State), Ksenia Nosikova (University of Iowa), Dr. Svetozar Ivanov (University of South Florida), Gabriel Dobner (James Madison University), Dr. Janet Landreth (Colorado State University) and musicologist Dr. Jonathan Kregor (Cincinnati). Past guests have included Leon Fleisher, Murray Perahia, Magdalena Baczewska, Dr. Paul Barnes (Nebraska Liszt chapter) and harpsichordist Kenneth Cooper (Manhattan School of Music). 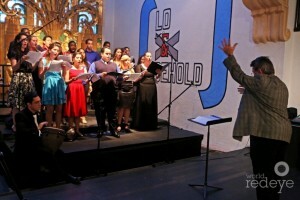 Voice students at FIU are offered a dynamic curriculum that includes private instruction from an outstanding artist faculty with national and international reputations. The members of the FIU voice faculty have performed with major opera companies and orchestras from around the world. They bring their profound artistry, professional experience, and creative teaching abilities to the FIU student body. In addition to regular performances with FIU ensembles, the voice faculty also remains active in the professional field, representing FIU in solo performances and master classes around the world. The School of Music’s Guest Artist and Artist-in-Residence programs bring FIU voice students into contact with an extensive array of prominent performing artists and composers each year. Learn Why FIU Is For You! Wind and percussion students are offered a dynamic curriculum that includes studying with an outstanding artist faculty, renowned for their work as award-winning soloists and as principal players in the regional orchestras of South Florida and other areas. Their professional experience and creative teaching styles are well-respected internationally as well. In addition, guest artists and artist-in-residence programs continually bring to our campus an extensive array of significant musicians into contact with our music students. The curriculum places emphasis on solo performance, chamber music, and large ensemble performance. Scholarships, including out-of-state tuition waivers, are available. The Choral Conducting Program at Florida International University School of Music is constructed to prepare the successful candidate for a myriad of conducting possibilities. Each candidate will have a large number of conducting opportunities with close observation and mentorship from Kathryn K. Longo. Graduates of the FIU Choral Conducting Program hold positions in some of the finest High School and University Programs in the country. Graduate Conducting Assistantships are available to the exemplary candidate. Due to the limited number of available positions, early application is encouraged. 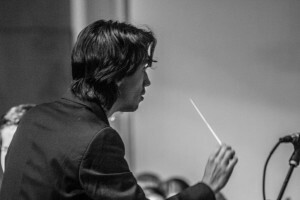 The FIU School of Music offers a program for a limited number of talented conductors to pursue Master’s degree in conducting under the tutelage of Maestro Grzegorz Nowak, Principal Associate Conductor of the Royal Philharmonic Orchestra in London. Successful candidates must be outstanding musicians with talent and passion for orchestral conducting. Conducting students receive plenty of podium time with the FIU Symphony Orchestra during rehearsals and concerts throughout the year. They also serve as assistants to the faculty and visiting conductors in orchestral and operatic productions. Distinguished visiting conductors in recent years include James Judd, David Effron, José Serebrier, Neal Varon, Eduardo Marturet and Giancarlo Guerrero. The Wind Conducting Program at Florida International University School of Music is constructed to prepare the successful candidate for a myriad of conducting possibilities. The successful candidate will have a deep knowledge of the music for winds, brass and percussion coupled with a passion for conducting. Each candidate will have a large number of conducting opportunities with the Symphonic Band, Chamber Winds and Wind Ensemble, with close observation and mentorship from Dr. Alston and Professor Bernhardt. Graduates of the FIU Wind Conducting Program hold positions in some of the finest High School and University Band Programs in the country. Graduate Conducting Assistantships are available to the exemplary candidate. Due to the limited number of available positions early application is encouraged. 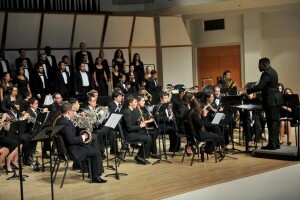 The FIU Music Composition Program is designed to give students a strong background in the techniques and languages of a variety of musical styles ranging from common practice music to the most experimental contemporary approaches. Combining a strong emphasis in writing with analysis, the program is designed to produce composers who are proficient in a variety of musical languages while at the same time allowing for the evolution of an individual’s personal compositional craft and approach. A strong emphasis on musicianship including the performance and conducting of a student’s own works further enhances the young composer’s development as a competent musician. Numerous performance opportunities of students’ works by excellent performers and ensembles as well as hands on experience in the use of new technologies including MIDI, computer music, and interactive and notational software are an integral part of the curriculum. Many of our graduates have continued studies at other prestigious schools and have been the recipients of ASCAP and BMI Student Composition awards. The music composition program at FIU prepares students for either continued graduate studies in composition or as skillful composers continuing in a variety of other venues. The FIU Music Business program prepares undergraduate students to be leaders in the dynamic, global music industry of commercial and classical music. Defined by a cross-disciplinary curriculum, the program combines your artistic and music creative ability with that of the general music industry, while providing the opportunity to obtain business courses and leadership and managerial skills. Students are expected to be highly motivated and prepared to take advantage of the many resources the University and School of Music have to offer. The program is structured to have academic courses, music practicums, and internships. 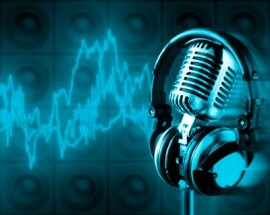 The curriculum promotes critical thinking, and prepares global leaders and versatile music business administrators. Students in the music business curriculum learn the skills necessary to work in the fast paced music industry of the 21st century. The Department’s acclaimed faculty, College of Business acclaimed faculty, state-of-the-art facility, and internship opportunities provide the music business student with a well-rounded education with insight into the music industry from a unique global music and business perspective. 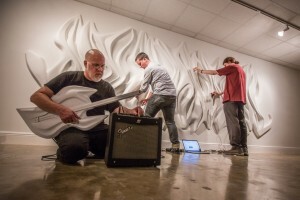 Scott Hall, in foreground, plays the monobaribasitar accompanied by FIU Music Technology Director Jacob Sudol and a teaching assistant use transducers, creating a surreal musical performance. Photo courtesy of FIU News. Over the last 20 years, there has been an increased need in the computer and electronic music industries and in the arts and technology communities for the acquisition of knowledge and techniques from a number of disciplines. The discipline of music technology is not new. Many names have been applied to the field–electronic and computer music, electro-acoustic music, digital media arts, multimedia, and intermedia to name but a few. However, with the arrival of inexpensive, personal computer hardware and software, the field has garnered much attention in recent years. The Music Technology program at FIU focuses on the research and creative based applications of these technologies. This includes the development of new software; exploring new interfaces for music technology such as designing digital instruments, microphones, and speakers, or hacking pre-existing hardware; as well as writing compositions or developing creative projects that incorporate new technologies, video, sound art, and/or interactive systems. Click here for more information about the Music Education Graduate Program. All entering music majors need to take certain diagnostic tests in order to determine the appropriate placement level for academic music courses. All incoming graduate students are required to take the HistoryandTheory Placement Tests. The Theory Placement Tests may be taken either on one of our audition days or on the Thursday before the first week of classes in both Fall and Spring. Get started onGetAcceptd today! Good luck on your journey! We look forward to meeting you!